Tis done! I've just gathered together all the new spells I've posted here over the last X amount of time (not sure how long it's been) pertaining to all things elemental, and formatted them into a PDF for easy and pleasurable use at the gaming table. Contained within is the elementalist class, with a full spell list of 1st to 9th level spells, and an array of new elemental creatures to be summoned. None of my players have rolled up a character using the new class as yet (though anyone who gets a good Int score will be bound to receive some hints from me now ;), meaning that all the new spells and monsters are gloriously un-playtested. I'd be delighted to get feedback from anyone who uses the class or any portion of the spells or monsters in the PDF in their own games! Using the powers of my newly acquired multi-function laser printer / scanner, I've just created this players' map of the mini area that my Labyrinth Lord games have been taking place in. It was originally a hand drawn map, which I scanned and then added the text and so on. I also removed a lot of features from the map, including everything inside the magical forest, as these are areas the player characters have no idea about -- the intention being that they can fill in the blanks as they explore. The map covers all the places mentioned in the few basic rumours the PC's have heard about the region, which I posted previously. No doubt partly inspired by watching the excellent Third Stage edit of David Lynch's Dune the other day, I've been contemplating the possible role of psychoactive substances in the life of an adventurer. So I've come up with a few such substances, which will be available to characters in my Labyrinth Lord game. They're just a first draft, so if anyone can see any glaring flaws please let me know! Salts of Vitesse: The product of a complex alchemical process, salts of vitesse come in the form of a fine white powder or small geometric crystals. When ingested, the recipient's nervous faculties are magnified, resulting in a quickness and precision of action and thought. This grants a +1 bonus to Dex and Int (to a maximum of 19), as well as the ability to act first in a combat situation against a foe where all other factors are equal. Salts of vitesse are mildly addictive, and can lead to a deterioration of a character's health over time. After every session in which a character has ingested salts of vitesse, he must make a Wis check on 1d20. A roll of above his Wis score means that the character will do everything he can to use the salts again in the next session. On a roll of 1, the character must make a saving throw against poison or suffer a permanent loss of one point of Con. The Black Paste, Alil: This thick black tar-like paste is extracted from the seeds of a desert plant. Alil can be chewed or smoked, and induces a brief cataleptic trance wherein strange visions may be experienced. In addition to these recreational effects, alil has a tendency to awaken latent psionic ability, which leads to it having a certain degree of popularity among adventurers. Any player character experiencing the alil trance must make an Int check on 1d20. A roll of under or equal to the character's Int indicates that the drug has activated a previously unknown part of the character's mind, and he gains a random psionic ability for the duration of the game session. The new ability should be chosen from the following (from Mutant Future): 1. Ability boost, 2. Combat empathy, 3. Empathy, 4. Increased willpower, 5. Intellectual affinity, 6. Know direction, 7. Mental barrier, 8. Metaconcert, 9. Mind thrust, 10. Accumulated resistance. (Use the guidelines in the Mutants & Mazes appendix as to how often these powers are usable.) Each time a psionic power is awakened there is a 5% chance of the character's Wis being permanently reduced by one point, as his mind loses its grip on normality. The Yellow Powder: The musky, sticky, rich smelling yellow powder is derived from the pollen of the Latimer orchid. When rubbed into the gums and tongue it brings about a mild hallucinatory state, wherein the recipient's capacity for visualisation and imagination are increased. The powder is used recreationally by many, including those of an artistic bent, but it is members of the illusionist class who benefit most from its effects. Due to the greater precision and depth of imagination produced, all illusions created by one under the influence of the yellow powder gain a +1 to attacks and damage. The yellow powder is not addictive, but it can lead to a detrimental state of internalisation and paranoia. Any session where a character uses the yellow powder, he must make a Wis check on 1d20. A roll of above his Wis score results in a 25% chance of an episode of paranoia some time during the session (at the DM's discretion). See the gorgonmilk blog for the paranoia table. Memory Dust: Infamous among magic-users of all kinds, this fine pearlescent dust is renowned for its ability to expand the human mind's capacity for the arcane energies required by spell memorization. Taken as a snuff, the dust gives a magic-user the ability to memorize a single spell of the level above his normal maximum (for example, a 1st level magic-user could memorize a single 2nd level spell). The dust is highly addictive. After every session in which a magic-user has made use of the dust, he must make a Wis check on 1d20. If the roll results in a number higher than his Wis score, the character will do everything he can to use the dust again in the next session. A roll of 20 indicates that the character's tolerance for the dust has increased, and from now on he must consume twice the quantity to achieve the same effect. A magic-user who continues to use the dust will eventually build up a high tolerance to the drug, and in the end will need to consume large amounts of it to gain any effect. Blood of Glory: This rich crimson viscous fluid is not in fact blood, though it bears a strong resemblance. It is actually the juice extracted from the pulp of the fruits of the Ylam tree. Imbibing a sufficient quantity of this 'blood' induces a frenzy of aggressive emotions which are especially strong in the heat of battle, leading to a berserk rage. Combatants under the influence of the blood of glory gain a +1 to hit and +2 to damage, but suffer a -3 penalty to armour class, due to the reckless abandon induced by the fluid. There are no detrimental side-effects of the blood of glory, aside from the inherent danger of fighting while under its influence. In case anyone sees this and is also keen, there's a thread over at the Goblinoid Games forum where people can express their interest in a hardcover version of Realms of Crawling Chaos. Dan has said that if enough people are up for it then he'd get a small run printed. I am now the proud owner of two d30 dice. Until recently I've always been of the opinion: "well no game I own or have ever played or am ever likely to play uses a d30, so why would I buy one?". Then the other day I came to think about random tables, and how to get the most "bang for your buck", so to speak. How to make a single roll pack in the biggest possible random factor -- and of course, the (or at least one) answer is to use dice with more faces. That sort of thing. And those are the kind of tables where it's hardly any more difficult to think up results for 2d30 (60 entires) than it is for 2d10 (20 entries), but the resulting number of combinations is a whole world of different. 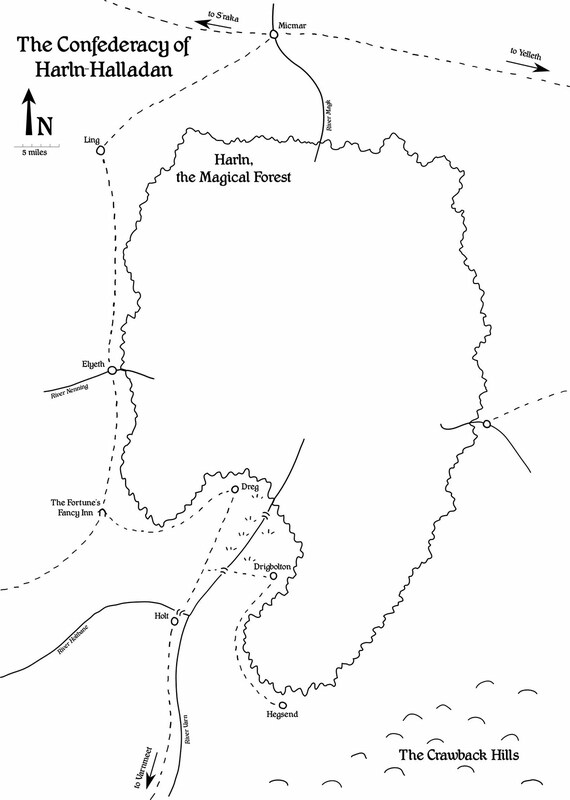 After starting off with just a "magical wood", a half-imagined far away city, and a dungeon, I've been putting a little bit of thought into the campaign setting which my Labyrinth Lord games have been taking place in. I really like the idea of keeping things very vague until they need fleshing out, so all details I've been making up have just been on the level of rumours the PCs have heard about places. I just sent the players these little snippets about the area they're in. 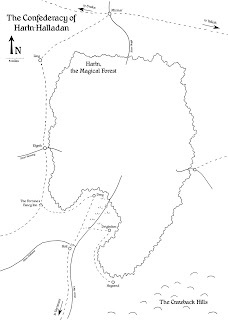 A small, and, on the grand scale of things, insignificant alliance consisting of seven towns spread around the western rim of Harln, the magical forest. Holt: A curious settlement situated along the south road to Varnmeet, in the nook where two rivers meet, Holt is dominated by the cult of Vardilli, “the spinning god”, whom the townsfolk worship with glee and abandon. Dreg: A town of ill-repute, or of ravaging fun, depending who you ask. Dreg is under some unknown (but much studied) magical influence which makes it impossible for women to conceive children there except on the night of the full moon. Consequently Dreg has developed something of a popularity with ladies of the night and their clientèle. Hegsend: Situated right at the southern tip of the magical forest, and overlooking the barren wilderness of the Crawback hills, Hegsend is a small and somewhat isolated town where outsiders are not often seen. Rumours tell that a few times a year Hegsend is visited by a procession of mysterious fey who come from the forest. Elyeth: The seat of the Confederacy, and home of its ruler, the Confederate Yagk and his order of truthsaying court wizards. Micmar: The town of Micmar lies at the northmost edge of the Confederacy along the great trade road from Yelleth to S'raka. It is a bustling place of many markets and exotic produce, and is home to numerous merchant houses. Ling: A fort-town built atop a high hill, overlooking the surrounding lands, Ling is known for its profusion of shrines and temples, including the famed oracles of the seven singing spirits, which are located in a ring about a mile distant from the town centre. Drigbolton: The small town of Drigbolton lies close to the edge of the magical forest, and is a gritty and grimy place. It is known for its proximity to a great marshland, and for its production of peat and raising of bog-swine. Continuing my work on an elementalist class for Labyrinth Lord, a couple more low-level elementalist spells just sprang unbidden into my mind, so here they are, hot off the mental press. The first is the semi-obligatory 'fairly decent damaging spell for 1st level casters', which I've been wondering about for a while (as elementalists don't have access to the magic-user's favourite, magic missile). A jet of flame or icy cold shoots from the caster's fingertip, causing 1d8 hit points damage to a single target in range if a successful attack roll is made. The ray may be used to attack once per round for the spell's duration, and can be targetted against a new opponent each round. The caster must choose which effect to create (fire or cold) when memorizing the spell. This spell gives the caster the ability to form patterns and shapes in a chosen elemental substance within range. Typically this spell is used to create forms in the motion of flames, the flow of water or the spiralling of smoke, but it can also be used to inscribe patterns in soft earth or dust. The forms created have no magical effect, but may be used to entertain or frighten on-lookers, or perhaps to pass messages. The spell's effect lasts as long as the caster maintains concentration and performs no other actions.